Getting accurate colors of the products I photograph for my website has been a constant struggle for a novice photographer like me. I feel I've made real progress for a modest investment following a wonderful article over at creativepro.com. Provides a screw stud for attaching a light assembly to one of their light stands. From the hardware store, these "L" brackets provide two vertical mounts as well as horizontal angle adjustment. They're tightened down with thumbscrews for convenient adjustment. 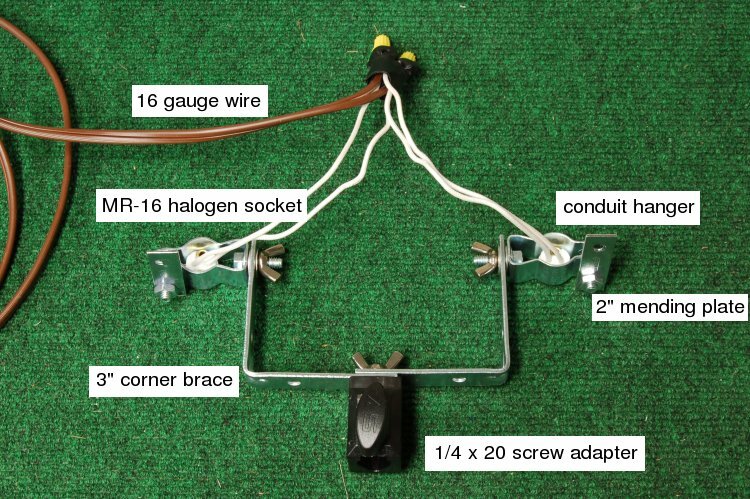 Instead of conduit, the hanger holds a halogen light socket. I used a 1/4" x 3/4" serrated flange bolt to attach the hanger to the "L" bracket and tightened it with washers and thumbscrew to facilitate vertical angle adjustment. These are attached to the hanger clamp bolt by two hex nuts and provide a handle for vertical adjustment of the lights--I expect the clamp to get too hot to handle comfortably. The filtered halogen bulbs (Solux) I need have an MR-16 base--one reason I couldn't use off-the-shelf fixtures I saw at the hardware store. Halogen lights use DC current. I'm expecting to use 2 50 watt bulbs but I spent an extra $10 for the 150 watt transformer just in case I need more wattage later. This one came with a socket at the end, but I cut it off and spliced the cord to the transformer. I'm planning to let the transformer rest on the floor, so I need a length of heavy guage wire (because of the high amperage) to run from the floor to the top of the light stand. The total cost has been $68 for the assembly and $14 for two 50 watt filtered halogen bulbs with most the assembly cost due to the transformer ($39). This does not include the cost of the light stand, but it does include the cost of various 1/4" nuts, washers and bolts as well as electrical connectors which one might already have lying about the shop.